I was bemused to note the order of the headlines in this morning's edition of the Washington Post online (which has since been reshuffled with news that's broken during the day today). The news of the incredibly successful and historic election in Iraq of course led the headlines, followed by news of SBC's planned acquisition of AT&T, further tsunami relief efforts, and so on. Former Democratic presidential nominee John F. Kerry ... in an interview on NBC's "Meet the Press" yesterday, praised his own campaign for coming close, and said he intends to "build on the campaign" by continuing to be a leading voice of the opposition. "I lost, Tim, to an incumbent president by a closer margin than an incumbent president has ever won reelection before in the history of the country," the Massachusetts senator told NBC's Tim Russert. "And if you add up the popular vote in the battleground states, I won the popular vote in the battleground states by two percentage points. We just didn't distribute it correctly in Ohio." The interview capped a series of events — including a trip to Iraq, a speech on health care and two mass e-mails to supporters — serving notice that Kerry wishes to retain the national voice he gained as his party's nominee during Bush's second term. Current and former advisers in recent weeks have said that Kerry's competitive instincts leave him inclined to seek the option of running for president in 2008, and that he intends to keep his profile sufficiently high to preserve that option. Once again I find myself questioning WaPo's editorial judgment: The availability of caffeinated beer — predicted by an episode of The Drew Carey Show some time ago — is obviously a much bigger story than anything John F. Kerry might have to say these days, and should have been given preferential billing. 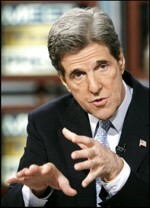 Still, even the comedic genius of Drew Carey would find it hard to improve upon Sen. Kerry for absurdity. He "lost by a closer margin than an incumbent president has ever won reelection before"? I think if we unmangle that syntax, he was saying that of incumbent presidents who actually won reelection, Dubya had the smallest margin, meaning (I suppose) that Kerry is less of a big-time loser than other losers who've lost to incumbent presidents, and less of a big-time loser than incumbent presidents who lost their reelection bids. I suppose that this (bad-)lawyer-speak tangle of thoughts and words is supposed to distract us from remembering, for example, about semi-incumbent loser Al Gore in 2000, and about actual incumbent loser Jimmy Carter in 1980. The correct answer, of course, is (d). But thus does the junior senator from Massachusetts attempt to pre-spin history's writ on where he will rank in the pantheon of famous losers. Meantime, while Kerry struggles to stay in the news by a boondoggle visit to Iraq, (yet another) speech on healthcare, and two "mass emails," newly inaugerated President George W. Bush — basking in the glow of another noble gamble that's paying off bigtime as the Iraqis celebrate their successful elections — continues leading the nation and the (expanding) free world. For this, I am thankful. For John Kerry's drop into the marginal, also-ran headlines, I am doubly thankful. I withhold judgment on caffeinated beer until I've tried it, but there's a chance here of a gratitude hat-trick in today's news. However, I sense a great potential here should American Express choose to revive its great advertising campaign of a few years ago. Amex could probably get a sweet package deal in Massachusetts on the specific actors they'd need. The TV commercial fades in with an overhead shot inside a neighborhood bar in South Boston, in which two guys in suits are trying to get the bartender's attention through a noisy, thirsty crowd. One tries putting on his tanker's helmet, and the other puts on his mystery CIA-guy hat from Cambodia, but it doesn't work for either of them. Suddenly they're saved by a more familiar face, someone who crashes a path through the crush of bodies — nobody gets, or stays, between Teddy Kennedy and a bartender — and the crowd parts like the Red Sea before Moses' outstretched hands. And as the bartender goes to fetch their drinks, Teddy, Mikey, and John-Boy hold up their Amex cards to the camera and say in unison: "Do you know me? I ran for president in" —and they respectively finish their lines — "1980," "1988," and "2004!" Then Teddy slaps down his Amex card on the bar and shouts, "Barkeep! Caffeinated beers for the house, on my Senate expense account!" Cut to a shot of Theresa standing at the end of the crowd, holding a pink poodle and wagging a finger at John while mouthing the words, "Decaf for you!" He rolls his eyes, but holds up his own platinum card and says, "The American Express card — don't leave home without it!" Much thanks to the many people who've posted comments or emailed me inquiring about my long lapse in posting. I'm flattered and frankly surprised by the interest. Nothing's wrong. I've still been skimming the blogosphere and the MSM, of course. Since the election, I just frankly haven't had much to say on the big topics that I thought really would be of much interest to anyone, though, or that others weren't saying as well or better than I could. And my clients — who got "just enough" attention during September and October — deserved some more intense and sustained focus since then from the crusty old grey-bearded lawyer they've hired. However, I had a goodly sized international commercial litigation case that settled in mediation on January 3rd, and a somewhat less huge but very time-intensive one that settled late last week. There are still hot irons in the professional fire that need to be rotated, adjusted, and sometimes whacked upside my opponents' heads (metaphorically), but I hope to have some time for more regular blogging soon. In particular, I'm about halfway through reading Hugh Hewitt's latest book, Blog: Understanding the Information Reformation That's Changing Your World, and hope to have be in a position to write a nontrivial review within the next week or so. So if you haven't deleted BeldarBlog from your bookmarks yet, you might hold off a bit longer. And again, to those who've noticed my lengthy recent silence, thanks again for your interest!